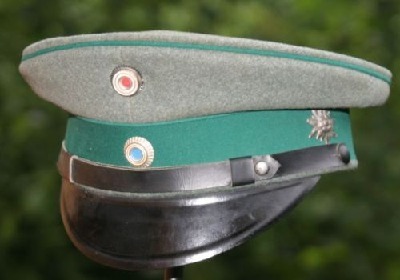 A Bavarian Jäger Visor hat with the Edelweiss given to the unit for their participation in the fighting in the Tirol. At the beginning of July 1915 the Italian artillery in the Col di Lana sector began to work overtime. This included batteries of heavy guns that had recently been moved into the area. It was obvious an offensive was on the cards and once it started the fighting was to last from the seventh of July into the first week of August. It was exhausting fighting in which the 2. bayer. Jäger Bataillon and the Goslar Jägers would gain many laurels. For the Italians the Col di Lana was of great importance. From the mountaintop there was an excellent view deep into Italy and the Austrian Tirol. Whoever occupied the crest of the Col was able to observe the roads through the Dolomites over the Pordoi-joch into the Fleimstal (Fleim valley) and over the Campo Lungo into the Pustertal (Puster valley). It was impossible for the Italians to move through the Cordevoletal or Pustertal as long as the Germans or Austrians had possession of the mountaintop. Not only could the German artillery observers direct their fire on the roads, but they could also observe the approaches. 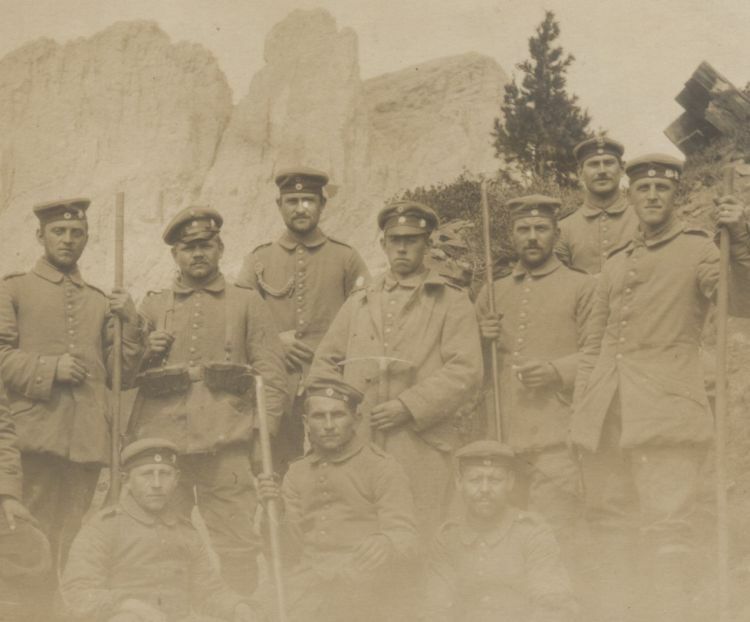 Above: Jägers of the 2nd Bavarian Jaeger Battalion in the Tirol. 2nd from the left, back row is Michael Taffner. The Alpenkorps Mountain Artillery, helped by the Jägers, Pioniers and Austrian Landsturm had, in a superhuman effort, manhandled their guns into position on the Monte Sief, the Siefsattle and the Falzarego Pass. From these positions they were able to provide flanking fire in the battle for the Col di Lana in the coming weeks. 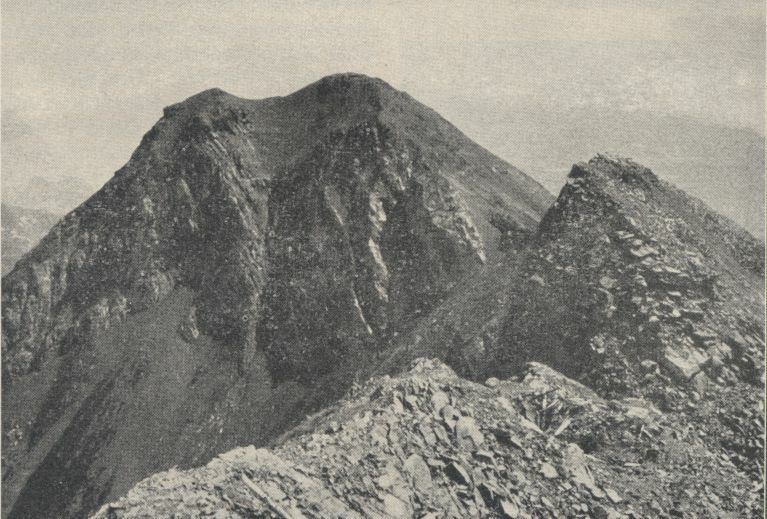 On the seventh of July 1915 the first assault was launched on the Jägers in the forward positions on the Col di Lana from the direction of Agai. Here Leutnant Henke (4th company) with thirty-two Jägers and 135 Gendarmes and Customs officials held the position. In the early morning the men in the advance guard post opened fire on the approaching Italians causing them to retire. In the middle of the day they appeared again in skirmish lines followed by columns of men approaching from Andraz and Pieve. The two enemy battalions tried to encircle and bypass the position. One column was halted with heavy fire but the second column managed to progress along a wooded area. The Jägers were spread here in a thin defensive line of isolated foxholes and hides. From these they ambushed the Italians as they advanced, opening fire from point blank range. At 6 pm the men in the forward positions were ordered back to the main infantry position on the Col di Lana. They arrived at 2 am. Over the next few days the Italian attacks concentrated on height 2221 to the east of the Col di Lana and on the infantry position in front of the Col itself. Italians took their revenge with heavy bombardments on the weakened positions followed by furious assaults, sometimes up to five in a single day. The month of July passed with seldom a day without an enemy attack. The Jägers of the Alpenkorps beat them back fighting hand to hand and counterattacking. On the morning of the second of August the Italian bombardment reached a crescendo. The Jägers prepared for the difficult day ahead. The bombardment continued throughout the day until 8pm when the Italian infantry attacked. On the left flank the attack was stopped but the third Italian assault on the right flank allowed the enemy to gain a foothold in a small section of the front line. A group of Jägers chased them out with hand grenades. The morning of the third of August was quiet but later in the day the bombardment resumed with an incredible fury while the Italians struggled to broaden the gap. Within moments the field telephone cables to the rear were destroyed. At 4pm the enemy troops threw themselves at the Jägers, managing to occupy a seventy meter long section of the Kanzelstellung Trench that had been flattened by the artillery. The Jägers held doggedly to the left and right flank of the breakthrough. Due to the small amount of Jägers available a counter attack to dislodge the Italians failed. The Jägers did, however, manage to prevent the Italians from widening the gap. Attempts by the Italians to squeeze more troops into the breach were beaten back with hand grenades. The telephone connection to the rear was re-established and reinforcements were requested. The 2. Komp of the 2. Bayer. Jäger, a section of Goslar Jäger and a group of Pioniers was sent forward. It was a beautiful August evening as the men marched out. The Italian searchlights sent their beams bouncing off the crests and into the valleys creating a world of light and shadow. All through the valley and from the heights the muzzle flashes of the artillery lit up the night sky, the guns sending a hail of steel towards the infantry positions on the Col di Lana. At regular intervals salvos of heavy artillery shells roared through the valley on the way to the fortress of Corte. 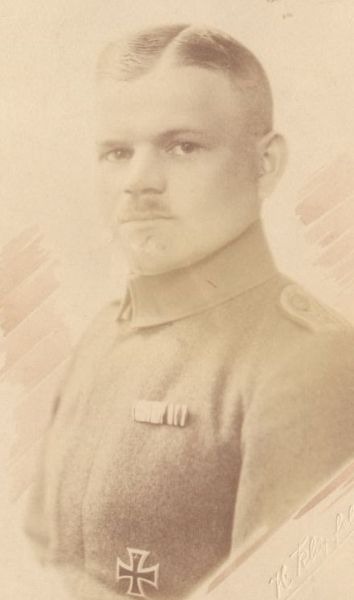 Leutnant d.R. Michael Taffner who served with the 2nd Bavarian Jaegers in the Tirol as a NCO. As the reinforcements approached along a gully the Italian small arms fire began to whistle past their ears. From the heights above rocks shaken loose by the explosions came crashing down. Waiting for a lull between salvos the men clambered out of the gully and trotted the remaining distance to the infantry position where the mood was at the same time tense and excited. The counterattack was carried out by three groups. The bayer. Jäger was to attack the Kanzelstellung from the right, the Alpenkorps Pioniers from the left and the third group, consisting of Goslar Jäger and remnants of the original defenders was to take the liaison trench once the flank attacks were underway. The Minenwerfer opened the attack by dropping bombs into the valley below where they exploded in the section of trench line which had been captured by the Italians. The explosions caused panic and confusion in the packed ranks below. The shouts and cries of the Italians were drowned out by the loud “Hurrah’s” of the attackers and the explosions of hand grenades. The group on the right broke through the enemy’s hastily erected barricade and began to fight its way along the trench. On the left the Pioniers had also succeeded in breaking through as had the middle group. The fighting was bitter with no mercy shown in the hand to hand tumult. The enemy soldiers that were not killed fled in panic. The Italians were to rename the Col di Lana the Col di Sang (blood). Early the next Morning the Italians tried to avenge their loss with another furious bombardment but it was not followed with another attack. Towards the end of August another lively infantry battle took place on the Col di Lana when on the night of the 26th to 27th the Bavarian Jäger attacked an Italian forward position near the Siefsattel causing heavy enemy losses. After a heavy bombardment the enemy sought to retake the position but the counterattack was stopped with artillery and hand grenades thrown by the Jägers. No matter how often the Jägers rebuilt the position the Italian artillery made it untenable. The Jägers destroyed their abandoned the position. On the 22nd of September the relief of the 2. Jäger Bataillon began. The Col di Lana would be one of the most glorious pages in the battalion history. From the mountain they were moved to another position in the regiment's sector, the Goslar 10. Reserve Jägers taking over the mountain. There were no further major Italian attacks, but the artillery continued to make life hell. The men of the 10th. Jägers were continually forced to rebuild their positions and prepare them for the coming winter. On the 1st of October the first sleet and snow fell in the valley. It melted rapidly but new storms followed with increasing frequency. The night frost on the mountain paths made the passage difficult and dangerous for men moving between the positions and advanced posts. The cold began to take its toll as temperatures fell to -8 degrees and more and more men were evacuated with frostbite. When the winter clothing finally arrived in Corvara it was too late to issue it. The Alpenkorps was leaving the Tirol for Serbia and the 3. 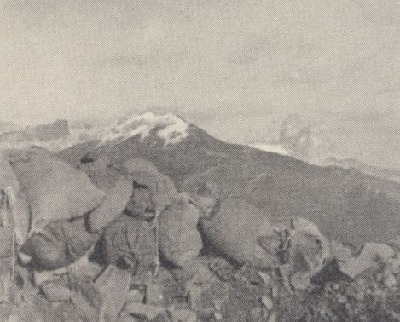 Tiroler Kaiserjäger Regiment took over the Col di Lana.